This week, I got some help from a neighbor who was happy to load me up once again with plums. You may remember that this has happened before. And it seems, this 10lb bowl was just what I needed to get back and have some fun in the kitchen. 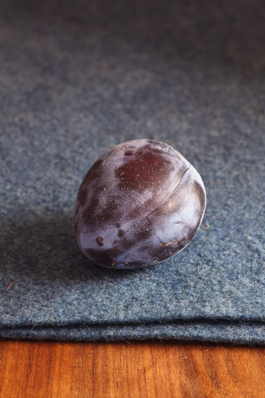 I have all sorts of plans for these plums. 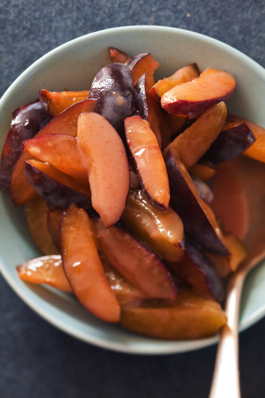 A plum slump from Rustic Fruit Desserts: Crumbles, Buckles, Cobblers, Pandowdies, and More. Some savory donuts like these, except using pork & plum instead of duck & cherry. Definitely some plum jam to put away for winter. But to start it all out, I made these adorable little Plum CupPies with a bit of left-over pie pastry and just a few handfuls of the plums. I have some family coming in tonight for a quick night stay only to hop on a plane at some ungodly hour of the morning and thought it would be nice to send a couple of small treats with them. 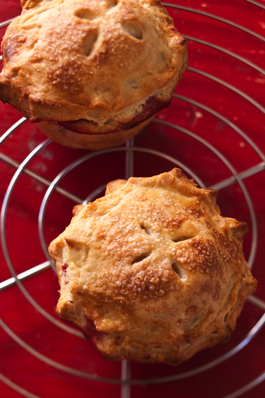 Pies baked in cupcake tins seemed just the thing. Especially after I found the beautiful ones on Eggs on Sunday. Of course, I had to try one myself first, to make sure they were ok. Then, I just had to keep myself from eating all of them. I mean, they give them peanuts on the plane afterall, right? To make your own CupPies, simply cut out circles of pie pastry large enough to leave a bit of overhang around the edge of the cupcake tin. Gently push the pastry into a cup, leaving a bit of rim around the edge. Leave an empty cup between cup pies. Fill with your favorite fresh, sliced fruit (cored or pitted as necessary… but skins on is ok) mixed in with a handful of sugar, lemon juice, cornstarch or flour, and a dash or two of spices. Top with another, slightly smaller, round of pastry and pinch shut. Brush with a bit of egg wash, sprinkle with sugar, and cut about 4 vent holes in the top. Bake at 425F for about 15 minutes, then reduce the heat to 325 and bake for another 10 to 15 minutes or until the filling is furiously bubbling and the tops are golden brown. Eggs on Sunday has far more detailed instructions, if you need them! This entry was posted in Desserts, Food, Recipe, Sweet. Bookmark the permalink. Lara, what a beautiful idea! And your pictures are phenomenal as always! I am guilty of having tons of fruit and I think I know what I am going to make with them… I can invite some friends from school over and treat them to my baking. I love Seattlites. My neighbor just brought over several cups of Italian plums as well and I’m thinking I should bake one of your mini pies as a thank you to them. What a fabulous idea! I think I’ll be making my own version of these sometime soon. Genius! the pies are too cute! Love Italian plums! The cup pies are so cute. Is it bad that the table and cake stands caught my eye slightly even more?!! I can’t help it! Stunning photography!! This is such a cute idea. Fabulous idea!!! and your pictures are simply gorgeous. 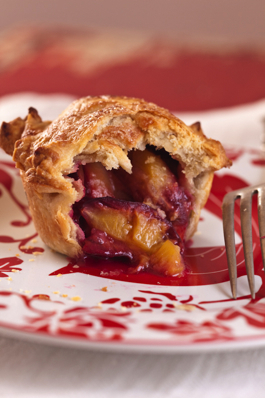 Here too (in France) plums are delicious now, and I bake them in tarts every weekend . WOW! those are pretty and they look wonderfully delicious..
Oh, they’re *beautiful! * As are your photos – simply gorgeous. What a great idea to use plums! I’m happy I found your blog through your link – will definitely be following! When does the donut testing extravaganza happen? I am out of town (and crazy getting ready now) until mid October but would be interested, if it can wait a little. Such a great idea. I can think of a ton of fun flavors that could go into these CupPies. This is a great idea! It’s so fun and perfect for guests. I love it! Those look fantastic! I’ve made cuppies before (my fav were the pumpkin pie cuppies), but I’ve never used such a thick crust. I’ll have to try your method. These are adorable. The headline caught my eye and I was immediately intrigued. I can’t wait for stone-fruit season! Would love to test donut recipes. Especially the chocolate macaroon! Amazing photos =)I specially love the ones of the already cooked Pum CupPies: the imperfections of the table give a warm and rustic touch that I like very much. And the combination of the colors is very good too. 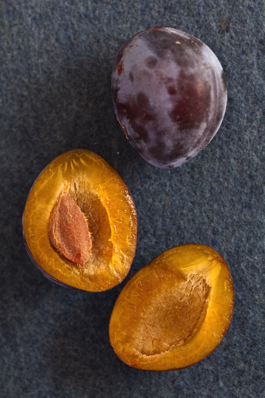 I love this type of plum. I’m lucky to have plenty around here (Italy) at this time of year, they make the end of summer less painful to me! Thanks for the beautiful pictures! Have to say cup pies caught my attention. They look gorgeous. Plums are gone now, but I can try them with apples or pears. Btw, would be happy to be a donut tester if you need one. These are ADORABLE! And the portion size is so “kid friendly”….can’t wait to make these with the nieces and nephews during the holidays! Precious! LOVE these! Such a clever idea. Look delicious…you have me dreaming of all sorts of fillings! Yum. I love this creative variation on the hand-pies that seem to be everywhere this year. Please count me in if you’re looking for doughnut testers! I was brought in by the pictures, which are breathtaking (I like the distressed red table best) but I now have to make the plum cuppies – plums are in season here, it’s getting cool enough to bake, and they are perfectly portable (I think) for walking to a tailgate party. thanks!! Another amazing idea with gorgeous photography! Beautifull idea!! !…perfect for these first days of autumn!! Oh the plums are just so adorable, and I love the little cake stands too! If you’re still looking for recipe testers, I’d be happy to help, just let me know. Why have I never thought of this? The structural sides and tiny pie look make these so much more appealing than a turnover, somehow. Thanks for this! 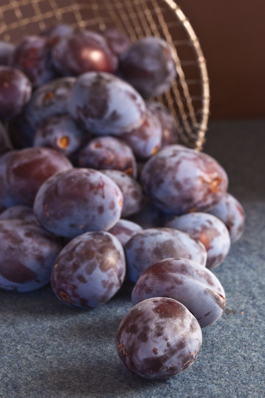 those plums look gorgeous. and cuppie? what a great idea! Beautiful little pies! So cute. I’d make them if I had a neighbor with a surplus of plums. 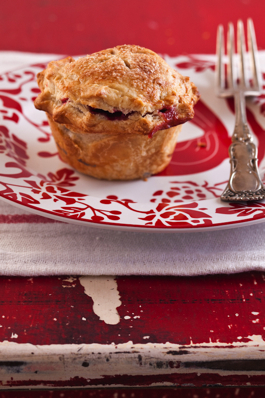 I love the red table the pies are on… the paint wearing away gives the pictures so much charm and character! 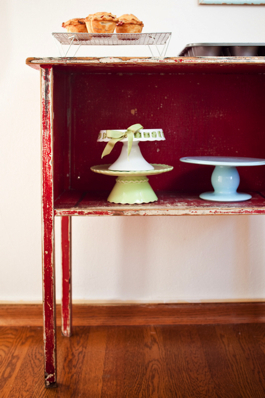 The series of red and white photos with the worn table is completely captivating… wow.